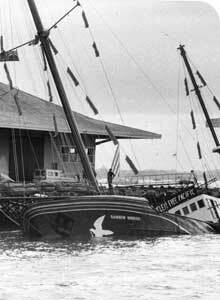 ... 1985 (25 years ago today), at a High Court in Auckland, New Zealand, 2 agents of the French secret service pleaded guilty to charges of arson and manslaughter arising out of the bombing of the Rainbow Warrior the previous July. The vessel, owned by the environmental nongovernmental organization Greenpeace, sank (photo credit), and one of its photographers drowned. The bombing had taken place, according to the BBC, "just before the Greenpeace team were to set sail to Muroroa Atoll -- a French territory in the Pacific Ocean -- to protest against French nuclear testing there." 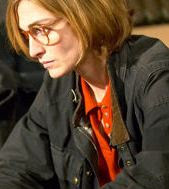 Dominique Prieur (above right) and her fellow French agent would be sentenced to 10 years, yet released in 1988. Later she became a human resources staffer for firefighters in Paris.